Notes: The Serendipity is actually an old pattern from Europe where it is known as a Buzzer. The late Ross Marigold, a Madison River guide, is acknowledged as the creator of today's version of the Serendipity. The pattern started out as a smooth floss body of brown or olive with a gold wire ribbing. 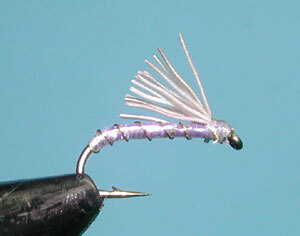 Ross added a clipped deer hair wing to the fly just behind the eye. Later, he modified the body with a noodled floss or Antron yarn to give the appearance of a segmented body and spun the deer hair for the head which gives the pattern a degree of floatation. Ross introduced the fly to Craig Mathews in 1988 and Craig marketed the fly utilizing Z-lon for the body. This has become the most common body material used on the Serendipity. 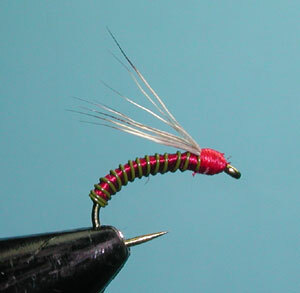 Colored wire for the body material is also popular when the pattern is used in moving water as a midge pupae. 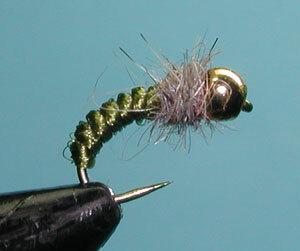 The fly is usually tied in Red, Brown, Dark Olive, and Light Green. 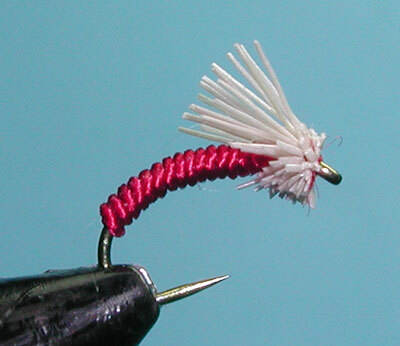 Red Thread is traditional with this pattern as it gives a red underbody to the pattern. If you place the deer hair on top, then use a thread that matches the body. If the deer hair is unclipped behind the head it represents an emerging midge. This is very effective in stillwater conditions of lakes and is fished with a floating line on or near the surface. In moving water, the Serendipity is generally fished near the bottom using split shot and an indicator with the head entirely close-clipped. Some will replace the deer hair head with a beadhead and Hare's Ear thorax for better depth control. 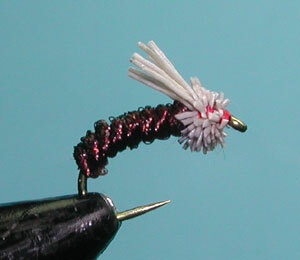 Craig Mathews ties another version of this fly, called the Crystal Serendipity. The deer hair is placed on top of the shank and not spun. It utilizes a Pearl Krystal Flash body with a fine gold wire ribbing.